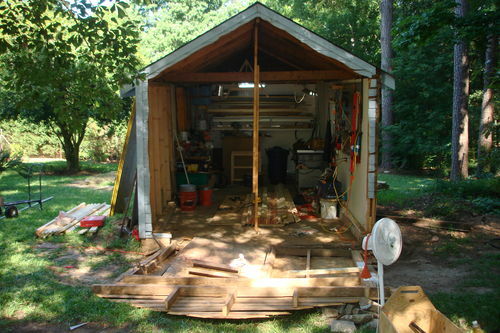 I’ve got a 12’ x 20’ outbuilding which was a one car garage that dates back to 1951. I renovated it about ten years back. insulated it, put up 1/2 cdx ply inside, painted it white, and put in a room AC unit and an electric heater. One large door on the end, no windows. It’s solid, but not great. Its skinned in OSB with good paint, and so far there is only one section that is not so good. But it really is getting kind of small. I am thinking of moving the long wall 6’ closer to the house which would give me about 17’ by 20’ when I am done. I’ll be 60 this year, and honestly, with the bum foot and arthritis, I don’t think I can do it by myself anymore. It would mean framing out two walls to extend the width, and moving the exist wall out to meet them. Propping up the current roof on one side – going up and down ladders. It would kill me, unless I had a couple of strapping young lads to do the grunt work. I could probably do the new wiring, insulation and interior sheathing though. Which do you think would be better and or cheaper, assuming I will hire a crew to do it? Tear the whole thing down and do a decent workshop with windows and proper siding? Or moving out one wall like I described? The picture shows the front wall I had to tear out 10 years ago. So it is the left wall I would be moving to the left by about 6 feet. Have you considered taking that garage down? I would get a prefab dropped in its place, it would be nice and new and all that would be needed is electricity. To move the wall you will have to restructure the roof framing, do some foundation work, get permits and inspections….. It might be cheaper to see if a company like Tuff Sheds could just build you a new one. If I understand what you are saying, it sounds like you are really only saving one wall since you would also have to redo the roof and rafters and both end walls to cover the wider space? Since you are not going to do the work yourself, I like the idea of having a prefab unit brought in and delivered or erected on site, then you just have hire the younglings to do the demolition (or hook it up to the bumper of your truck and pull it down after cutting some key points with a sawsall). Better: A tear down / rebuild. It’d get you windows, siding, a decent floor, higher walls (likely) and a quality shop. Cheaper: A tear down / rebuild. Messing around one old wall and 1/2 a foundation and floor is inefficient. The right crew could bang out a new structure with much less hassle if the old is gone. I think no our local Amish sells a prefab two car garages for about 12000. Comes in kind of lik a double wide. Probably be cheaper to save what you can of the existing structure. May not be better…....You are in a warmer climate. Have you thought about a pole building or a metal building. In our area I have seen people convert these metal carport structures into more permanent structure by adding steel on the sides and ends and adding insulation. Good luck with your project.